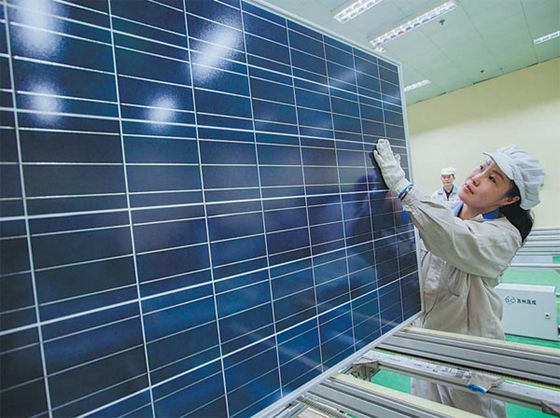 Solar panels: Protectionism for whom? Looking at certain recent events, there is sense of foreboding that they foreshadow a looming protectionist-based bitter, and prolonged trade conflicts with only Pyrrhic victories for those behind such moves. The United States and India, representing different levels of economic development, stand poised on the cusp of mass deployment of renewable energy, in which solar power will be the vanguard, heralding paradigm shift in humanity's approach to energy. However, both countries have decided to sap the strength of this much-needed shift away from "dirty energy" by imposing tariffs on the import of Chinese solar panels. However, there are objective and technical reasons why this step cannot possibly have any positive outcome for the parties involved. First, with alarm bells being rung by the scientific community the world over, and verified effects already clearly apparent across the globe, there is no debate that climate change is set to be an existential crisis the likes of which humanity has never faced in recorded history. There is no doubt that with China's combination of installed capacity, a trained and economical labor force and vertically-integrated supply chains, it can pump out these panels at the lowest prices available anywhere, thus helping to facilitate mass adoption. Also, with China's recent acceptance of the mantle of leading the struggle against climate change, it will do so in a manner that is least damaging to the environment. It also happens to manufacture two-thirds of the world's solar panels at present. In the case where India and the U.S. try to go their own route, the outcomes are fairly predictable and damning. The price of panels will be higher in the U.S., and various lobbies will ensure that widespread deployment faces as many hurdles as possible. India will face a wholly different set of issues, which will possibly be even worse. The panels will not only cost ordinary Indian's more, but there is a strong possibility that Indian manufacturing simply cannot operate at the required level in regard to economies of scale that will allow it to go for mass adoption any time soon. It will be bedeviled by turmoil within the industry in the mad scramble for a quick buck by the major players used to manipulating the system (for a good perspective on this consider the infamous "2G Scam," ranked 2nd by TIME Magazine in its list of Top 10 abuses of power since the magazine's inception). Furthermore, with India recently taking the lead in having the most polluted cities in the world, it is likely that a great deal of environmental concerns will be neglected as efforts are made to develop the necessary infrastructure for the hasty manufacturing of these panels domestically. The end result will certainly be to the environmental detriment of the surrounding countries, with the region having been identified as being most at risk from adverse effects of climate change. Meanwhile, the Indian market will be considerably more open to exploitation and profiteering by companies vying for contracts through any means necessary, with the inevitable emergence of even more corruption at various levels than currently exists. Secondly, the argument about job creation might be made to support development of domestic capacity. However, compared to the threats posed by automation, the job creation for solar panels will be minimal. In fact, the installation, deployment and maintenance of solar panels will create more sustainable jobs than their manufacturing will. And, in terms of manufacturing, the U.S. will gain even fewer jobs than India. According to a report released by the Solar Jobs Census, as of 2017, the number of Americans employed in the solar industry is 250,271. This is an increase of 168 percent since 2010. Only about 38,000 of those work in solar manufacturing, the rest are all on the installation and maintenance side. In fact, solar panel installation is on track to becoming the fastest-growing job sector in the United States in the next 10 years. The decision on tariffs also irked the Solar Energy Industries Association, which also represents space visionary Elon Musk's SolarCity. It declared the ruling would harm the industry and cost thousands of jobs due to slowdown in demand caused by higher prices. Thus, it would seem that the immense promise (and dire need) of cheap, accessible, renewable energy empowering humanity might go to waste in petty politics and misguided policies aimed more at protectionism and political rhetoric rather than a long-term, global vision. This also needs to be put in a broader perspective. Oil extraction from shale has allowed the U.S. to reach an output of over 10 million barrels per day, putting it on par with Saudi Arabia and second only to Russia. This marks the greatest amount of oil being extracted by America in nearly four decades (since November 1970). Thus, the possibility exists that Trump's decision (as advised by an independent, bi-partisan panel called the U.S. International Trade Commission) may have had other motives than protecting a few thousand jobs. In every way, the imposition of tariffs is a bad decision. The author is a media analyst and consultant with a background in journalism, currently based in Beijing. The decision by the U.S. and India to impose heavy tariffs on Chinese-made solar panels at such a critical juncture simply doesn't make any sense.